Andrew Steven "Andy" Turner is an English track and field athlete, competing in the 110 metres hurdles, and occasionally the 100 and 200 metres sprints as well as long jump. He is the current European and Commonwealth Champion at 110 m hurdles. Turner competed at the 2004 Athens Olympics, but failed to progress beyond the heats. 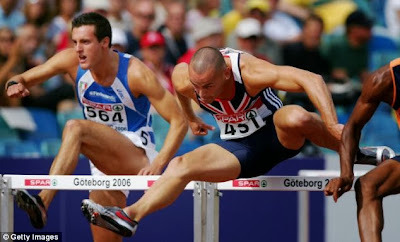 Andy Turner represented Great Britain for a second time at the 2008 Summer Olympics and reached the quarter-finals stage. His mother, Yvonne Turner died suddenly from a stroke on October 29 aged 58. Andy, 33, had to cut short the funeral after a neighbour phoned to say his car was missing from outside the family home. Reports suggest that when he arrived he found the house had been ransacked, and while his medals were still there, other valuable possessions were gone. Police believe Andy was targetted by thieves after he advertised the cremation on social media. Shortly afterwards the athlete tweeted: 'A car is replaceable but I had my last photos with my mum alive on my phone and laptop, that's what hurts the most.' The car, which has a personalised numberplate made to look like '110 RUN' was later found dumped in Bilborough; however - two iPhones belonging to his mother, along with his personalised Nike bag, are still missing. Speaking to The Sun, Andy said: 'I feel sickened. Mum was my biggest fan - she was always at my races, always supporting me. 'I've had to put my three daughters in a hotel because they're too scared to stay in the house.' The athlete had already tweeted that his mother's untimely death was 'the worst end to the worst eight days of my life'. Andy was widely tipped for success at the Olympics after winning a bronze medal at the World Championships in Deagu in 2011, but crashed out in the semis after being held back by injuries. He had previously competed in the 2004 and 2008 Games. The Nottingham-born athlete is the third fastest British sprint hurdler of all time behind Colin Jackson and Tony Jarrett and won gold medals at both the Commonwealth Games and European Athletics Championships in 2010. Burglary is heinous crime –Punishment is a deterrent, besides the wrong-doer must be punished for the offence committed and for handing out proper punishments – the Law and its enforcement should be strong. One of the Insurance coverage for property is against loss caused by burglary. Burglary is defined as the ‘crime of breaking into and entering a building with the intention to commit a felony.’ At common law burglary is primarily an offense against the security of habitation, and need not be against the property as such! ~ the criminal law of the country does not speak of an offence called burglary.